Neilson and Company was a locomotive manufacturer in Glasgow, Scotland. The company was started in 1836 at McAlpine Street by Walter Neilson and James Mitchell to manufacture marine and stationary engines. In 1837 the firm moved to Hyde Park Street and was known as Kerr, Mitchell and Neilson and, in 1840, Kerr, Neilson and Company, becoming Neilson and Mitchell in 1843. Locomotive building began in 1843 for the local railways. In 1855 production of marine and stationary engines discontinued and the company changed its name again to Neilson and Company. Among those who later became notable in the field were Henry Dübs and Patrick Stirling. By 1861, business had increased to such an extent, that a new works was built at Springburn, also named "Hyde Park Works." In 1864, Henry Dübs set up in business on his own at Queens Park Works, as Dübs and Company, taking a number of key staff with him. James Reid, who had previously worked for Neilson, however, returned and became a partner. When the Edinburgh and Glasgow railway was opened in 1842, it used a pair of Neilson & Mitchell beam engines to work the rope incline from Glasgow to Cowlairs station. The engines were covered by an article illustrated with drawings in The Practical Mechanic and Engineer's Magazine in Jan 1844. They were beam engines mounted on an entablature supported on fluted columns. The engines had 28 inch cylinders, and 6 foot stroke. They were supplied with steam at 50psi by 8 boilers, each 30 foot long and 5 foot diameter. By 1855, the company was building four-coupled tank engines, along with 2-4-0 and 0-4-2 tender locos. Some of these were for Cowlairs and St. Rollox, but many more went to India. Through the 1870s considerable numbers of 0-4-4 tank engines were built for the London, Chatham and Dover Railway, the Midland and the Great Eastern. Many other types were built for railways at home and abroad, including fifty 0-4-2s for India. The company's first eight-coupled locos were built in 1872, also for India. Neilson and Company supplied the first (F13 of 1872) and last (F216 of 1888) members of the 88-strong New Zealand Railways F class. Six builders supplied F class engines between the arrivals of F13 and F216. A character in The Railway Series by the Rev. W. Awdry is based on a Neilson prototype. Neil is a 'box tank' locomotive, who worked on the Sodor & Mainland Railway between 1856 and 1910. ^ Nicolson, Murdoch (1987). Glasgow : locomotive builder to the world. Edinburgh: Polygan. ISBN 0-948275-46-4. 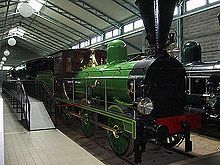 Wikimedia Commons has media related to Neilson locomotives.